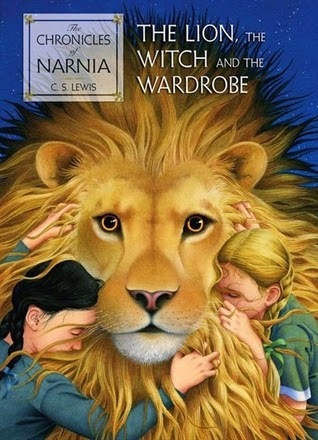 I may have only finished all of the books in The Chronicles of Narnia in 2013, but The Lion, the Witch, and the Wardrobe and I go way, way back. My family had the 1979 animated version of it, and I must have watched it dozens of times when I was a child. It stays surprisingly true to the book, lifting a lot of the dialogue straight from its pages. So when I read it for myself for the first time when I was eight or nine, it was basically like reading the movie, which made it really easy to read but not all that exciting. For that reason, I'm so glad my boys got to experience it for the first time as a book, rather than a movie. It was their imaginations that created the pictures in their heads, not some film director's. Even now, reading it as an adult, the pictures and images and sounds and voices that came to my mind were from that darn 1979 movie, and even though I'm sure they'll see one of the film adaptations at some point, I hope when they read the book, they always come back to their very first impressions of it. I'm guessing you know the story. It's a good one. It is the 1940's and four children (Peter, Susan, Edmund, and Lucy) have been sent away from their home in London to escape the air raids. They come to live at the Professor's house, a large sprawling estate that is just begging to be explored. One afternoon during their exploration, they come into a room that is empty save for a wardrobe on one side of it (incidentally, my boys had no idea what a wardrobe was). Peter, Susan, and Edmund take a quick look around and then leave, but Lucy decides to take a peek in the wardrobe. She climbs inside (making sure to leave the door open "because she knew that it is very foolish to shut oneself into any wardrobe"). She walks forward, expecting to find the back of the wardrobe, but it never comes. And after a few steps, she finds herself in a snow covered woods next to a lamp post. All is quiet and still when suddenly she sees a faun (Mr. Tumnus) carrying an armful of packages. They make their introductions and he invites her to his home where he tells her more about the land she has stumbled into. It is called Narnia, and it is ruled by the White Witch. She has made it so that it is always winter and never Christmas, and she is well aware that if the four thrones at Cair Paravel are ever filled by two Sons of Adam and Two Daughters of Eve, her reign will be ended. She is determined not to let that happen. My kids absolutely loved this book. I don't know if I've ever been interrupted so often while reading. Over and over again, they'd break in with guesses or questions for what was going to happen next or exclamations or protestations for something that just happened. Each night, after we finished reading, the two of them would look back over the chapters we'd already read and then read the titles for the upcoming chapters. They could hardly contain their anticipation, especially when the next chapter was something like, "In the Witch's House" or "What Happened About the Statues." It was one of those books that really held its weight in between readings and that we just couldn't wait to return to at the end of the day. In fact, there were even a couple of days where we knew we had activities that would prevent us from reading at our usual time, and so we read earlier in the evening because we couldn't bear the thought of skipping a day. For all that we loved it, however, I will say this: it is scary. We haven't read very many books with actual, evil, frightening villains, and I'm sure those of you who have read it will agree with me that the White Witch is one of the scariest villains out there. Max especially had some moments of terror where he told me to stop and not to read any more. (And if you knew how often during the other times he was begging me to continue reading, you'll appreciate how scared he really was.) I couldn't blame him. The scene where the dwarf ties Edmund to a tree while the White Witch sharpens her knife and he is only saved because a host of Aslan's subjects comes upon them in the nick of time is particularly terrifying (even though the scene is short and the details are limited). I basically had to spoil the whole book for Max (no one dies, the White Witch is thwarted, etc.) so that he could enjoy it without worrying about what was going to happen next. One of the reasons I personally love reading the Chronicles of Narnia is for the symbolism, but I wasn't planning on pointing any of it out to Aaron or Max. I just thought we'd enjoy the story, and if they picked up on bits of it here and there, then great. However, as we came to the scene where Aslan submits himself to the Witch at the Stone Table, the reference was too strong. I couldn't help myself. "Does Aslan remind you of anyone?" I asked, and after a little thought, they both said, "Jesus?" "Yes, Jesus," I said. "Isn't that just exactly like what Jesus did for each of us?" Some will say that making such a quick connection means the book is too overtly religious. I guess I can't make a definite conclusion one way or the other, but to me, it seems like if you're not religious, it will just read like a really good story with a villain and a hero, but if you are religious, then it adds depth and added insights to your beliefs, which I find to be a wonderful bonus. For me, one of the new insights I gained with this reading came just after the scene I already mentioned. Once Edmund is rescued, they can't find the Witch or the dwarf. They think she has escaped, and so they return to Aslan. But then this: "It was perfectly still and presently the moon grew bright; if you had been there you would have seen the moonlight shining on an old tree-stump and on a fair-sized boulder." These two objects turn out to be the White Witch and the dwarf, "for it was part of her magic that she could make things look like what they aren't." I think this made an impact on me because of things I've come across lately (on facebook, in the news, on blogs) that on the surface seem honorable or noble but leave me feeling troubled. Sometimes it's difficult to distinguish truth from its counterfeit. Out of the entire book, there's only one scene I would change, and I wouldn't even change it per se--just add some emotion to it. It happens right after the four children get into Narnia. As you might expect, Lucy leads them to Mr. Tumnus' home only to find the door bashed in and the whole place in ruin. You might expect, as I did, that Lucy will act shocked, angry, devastated, or sad. But she is none of these things. In fact, the reader gets Edmund's and then Peter's and then Susan's reactions before Lucy is even mentioned. Maybe I'm just more emotional than C.S. Lewis (although I have my doubts about that since the scene between Aslan and the girls is very tender), but this seemed like a really inexcusable oversight. I'm actually so sad this book is over already. We whipped through it even faster than usual because we all loved it so much. But I'm sad not just because it's over but because I want to read the next one to them, but it's Prince Caspian. Out of all the books, that's my least favorite, and I just can't get that excited over it. Maybe it's time for me to let Mike take a turn . . .